ORCHARD PARK, N.Y. (AP) — There’s nothing wrong with LeSean McCoy and Buffalo Bills‘ rushing attack, once they elect to stick with it. A week spent emphasizing how they weren’t going to abandon the run paid off in a 13-12 win over the Tennessee Titans on Sunday. McCoy and backup Chris Ivory played key roles in setting up Stephen Hauschka’s 46-yard field goal as time expired. McCoy finished with 85 yards rushing, matching his combined total from his first three games, on a season-best 24 carries. And Ivory had 43 yards rushing, with 22 of them coming on Buffalo’s 11-play, 47-yard final drive. Just like they drew it up, said McCoy. 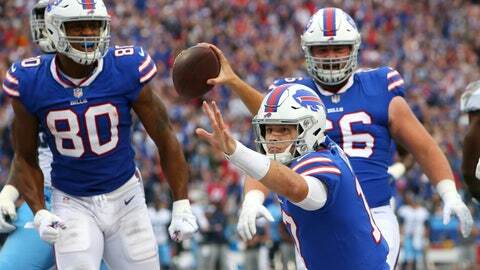 A week after managing 58 yards rushing in a 22-0 loss at Green Bay, the Bills racked up a season-best 141 yards against the Titans, including rookie quarterback Josh Allen’s 14-yard touchdown run to open the scoring. The defense also played a key role in helping Buffalo improve to 2-3. The Bills forced three takeaways, allowed just 221 yards offense and limited the Titans to Ryan Succop hitting four field goals. Tennessee dropped to 3-2 and took a step back a week after a 26-23 overtime win over the defending Super Bowl champion Eagles. Rather than enjoy their best start in 10 years, the Titans blew a chance to take over sole possession of first place in the AFC South standings after Jacksonville (3-2) lost at Kansas City. Marcus Mariota finished 14 of 26 for 129 yards and an interception. Running back Dion Lewis and receiver Taywan Taylor lost fumbles. The Titans’ best chance of finding the end zone slipped through their fingers early in the fourth quarter. Facing third-and-4 at Buffalo’s 23, Mariota avoided the pass rush and scrambled to his left, where he lobbed to receiver Nick Williams, who was wide open in the end zone. Williams had the pass drop through his hands while attempting to make an over-the-shoulder catch. McDermott and Beane were formerly with Carolina, where they both became familiar with Anderson, who spent the previous seven seasons with the Panthers. Buffalo is down to Allen and second-year player Nathan Peterman at quarterback after trading A.J. McCarron to Oakland on Sept. 1. “I’m not going to turn any help away,” said Allen, who improved to 2-2 in four starts. Tennessee’s Pro Bowl left tackle Taylor Lewan aggravated a right foot injury in the second quarter and did not return. Lewan said he first experienced pain in his foot during last season’s opener. The soreness returned following last week’s win over the Eagles. He said he felt “something pop” on Sunday. Lewan said initial tests show no signs of a break, and he doesn’t believe it’s a long-term injury. For the second time in three games, Succop accounted for all of the Titans’ scoring. But this time it wasn’t enough. Succop made three field goals in a 9-6 win over the Jaguars two weeks ago. Against Buffalo, he converted all four attempts, including a 54-yarder to match a career best. He’s now hit 13 of 14 attempts this season. Bills rookie linebacker Tremaine Edmunds forced Taylor’s fumble, which led to the Bills opening-drive touchdown. Defensive end Shaq Lawson forced Lewis’ fumble, which led to Hauschka hitting a 40-yard field goal to put Buffalo up 10-6. Rookie cornerback Taron Johnson jumped in front of a pass intended for Williams for his first career interception. The Bills, however, failed to come away with points after holder/punter Corey Bojorquez botched a field-goal attempt late in the second quarter.